Dustin Johnson is playing so good just now he will win all four Majors in 2017. At his ease. Dustin Johnson talks to Peter Kostis after winning the Genesis Open. After blitzing the field at the Genesis Open. DJ took over at No. 1 in the (ridiculously computed) Official World Golf Rankings for the first time in his playing career. Johnson's improvement in the 100 yards and in "scoring zone" has all but completed his game. He won three times in 2016, including a Major and has gone T6, T2, Cut, 3, Win in his last five starts. At Riviera Johnson topped the field in strokes gained off the tee stats and was third in putting. He drove the ball on average 315.3 yards and hit more greens in regulation than anyone else with 56. Johnson has seven top 10 finishes across all four Majors in the past three seasons, including that one win at the US Open in 2016. He also finished T4 in The 2016 Masters and T9 at The Open. 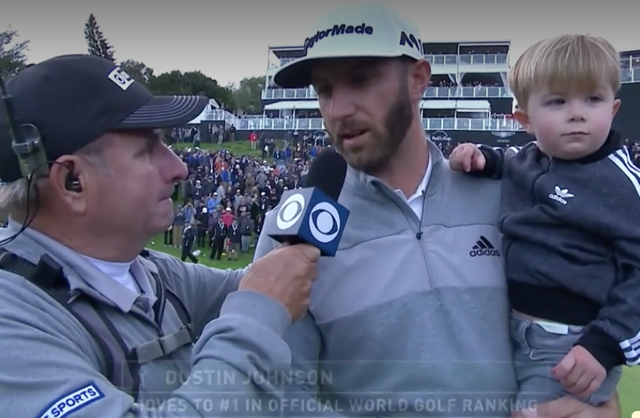 Perhaps more important to his success is that family life with DJ is on an even keel as Peter Kostis discussed a second child on the way with him after winning. All in all, with the intervention of mother nature, the Genesis Open was a bit of weird event. Here's a nice recap. Get your money on, Dustin Johnson will do the Grand Slam!